We had almost two dozen attendees reflecting — perhaps — a dozen boats. James and Christine won the prize for coming all the way from Calgary, Alberta, some 2,300 miles. We keep Red Ranger at Herrington Harbour North, so our trip was about 15 miles: 3 hours by boat. Shooting Star and Wild Outs, similarly, are close by. Allegria, however, came down from from Newfoundland. Some Whitby-emeritus owners (Ted, Alice, John, and Mary) live in the area so, they win the prize for shortest distance traveled. There are some key ingredients for a proper rendezvous. Introductions. And a boat card exchange. We all describe our boat and our favorite locations. We get to meet the folks we don’t know, greet the folks we've met before. We learn about folks new to the group, and new to their boars, as well as the folks with thousands of sea miles under their keels. Shared Meals. We use the West River Sailing Club and Betka’s Real Food catering service provided us wonderful meals Monday night, all day Tuesday and all day Wednesday, also. Boat Tours. With four boats at the dock, we can swap ideas, and learn from each other. I’ve seen these three boats several times before, and I’m starting to understand some of the smaller differences between them. Program. Ruth of Shooting Star built an amazing program this year. She seems to know a huge number of cruisers, and invited lots of them to speak. Jeanie and Scott talked about the Whitby-Brewer web site. Jeanie explained the detailed history of the boats she’s collected. This history can help a buyer learn about previous owners and previous names for a boat you’re thinking about buying. It also helps when you see a boat and wonder who you should hail on the VHF. Fred reviewed the rules of the road. “Red over Red, Captain is Dead.” Okay. It’s silly, but we’ve learned to recognize the lights of a ship not under command. Monty and Sara — the folks who publish Explorer Chartbooks — stopped by to tell us how and why they put their unique offering together. We learned about coloring scheme for the hydrography and their policy for stating depth. The books include tons of need-to-know information about the Bahamas. Since they offered us a discount, we bought the latest editions. Dee and Molly told us about their trip up the coast of Newfoundland. They shared details of anchorages, and spectacular photos. This wasn’t their first trip up north, and we learned how they managed the persistent SW winds they encountered. Molly Winans— editor of Spinsheet Magazine — told us about sailors and the twelve reasons why she loves sailors. Stories from a master story-teller are a delight. We demonstrated how flares work. We tried 12-gauge and 25mm flare launchers, signal rockets, SOLAS flares, and (cheap) locator flares. Out-of-date flares really do work. We saw how the pistol-like flare launchers can be unimpressive: a 12 gauge flare with a six-second burn is barely visible. If you’re going to use this, have a generous supply. The 25mm launcher with converter sleeve didn’t work out very well, either: when the flare misfired, it wound up jammed in the sleeve. Have multiple sleeves in case of misfires. The demonstration required a fair amount of coordination with US Coast Guard, Galesville Fire Department, Maryland Department of Natural Resources, and local businesses to be sure everyone was aware of what we were doing. You can see Molly’s Facebook post of our flare demo. Brian Smith from American Diesel stopped by to help us understand our diesel engines. We talked about a number of topics, including the frequency of oil changes and the complexities of getting all the oil out of the pan. We learned about the importance of looking closely at your oil as a diagnostic tool for how your engine is running. Kathy Barth from Seven Seas Cruising Association told us of the many benefits of SSCA membership. We have several members — and at least one commodore couple— in the Whitby family. What we’re doing is like an SSCA Gam on a smaller scale. We shared our stories of things that work — and things that don’t. As Milly Winans pointed out, it’s only about ten minutes before we’re talking about the boat’s head and the various complexities of marine sanitation devices. After lunch we had a brief business meeting to examine our finances. We pay for Whitby Brewer Sailboats. 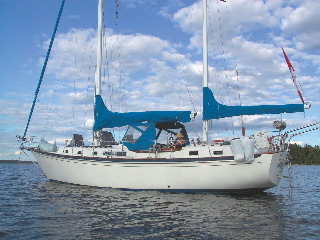 The rendezvous pricing is designed to break exactly even with the fees for Real Food and the West River Sailing Club. And that’s it. We have a couple of people who handle the tiny dribble of money. Ruth, Cindy Ann, and Maureen put the program together for the rendezvous. Steve showed how rock climbing safety techniques can be applied to ascending the mast. Use proper 22 kn rated carabiner clips, and use a figure-eight with follow-through knot for anything you’re climbing on. And then we moved on to visiting boats, having hors d'oeuvre and then eating a delightful dinner. An associated event can help. In this case, the Annapolis sailboat show starts the next day. Some of use will sail up to Annapolis to make last-minute purchases before heading south. A bonus this year was yoga at 07:00 both mornings. CA finished her instructor training at Blue Nectar recently. The morning program was designed to build up some strength and flexibility based on the kind of activities common on a sailboat. We are a group of sailors who own, use or are interested in Ted Brewer designed boats primarily focused on Whitby Boat Works Whitby 42 and 55, Ft. Myers' Whitby 42, Brewer 42, 44, and 12.8. The goals of the Association are simple: learn, share and help others learn about, maintain, repair, sail and enjoy their Ted Brewer designed boats. While there can be significant differences between models - and often variations between boats built successively - all share similar characteristics. You are invited to join and participate regardless of your experience level. There are no dues. Events are organized and costs passed on to attendees. Check the Local Rendezvous info to meet up with some of the folks who share your interests. Joining is as simple as registering on this site and participating..